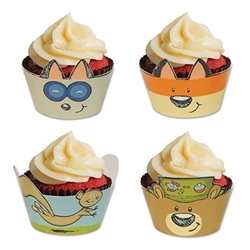 Those cupcakes look delicious already, but adding one of these Woodland Friends Cupcake Wrappers will surely make them look even more tantalizing. Don't they look great wrapped around a delicious chocolate cupcake with vanilla icing? Yummy! Besides matching the rest of the Woodland Friends decor, giving each cupcake a face is just about the cutest idea. Each wrapper measures 9 1/4 inches and there are eight (8) wrappers in the package, two (2) of each animal design.